Vocabulary is crucial to social, academic, leisure skills, and it is a big focus in the CCSS. Understanding word relationships is crucial in all academic subjects. And it has long been a major focus in many speech - language intervention sessions. 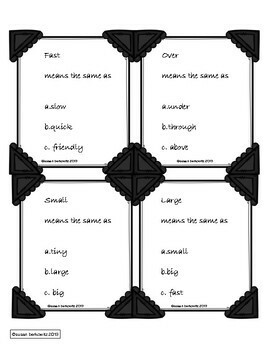 Here are some game cards for assessing or practicing synonyms and antonyms. You can use these to assess skills, to provide practice in class or at home or in therapy sessions. • There are now 2 generic game board and spinner to use if you use a game. • There are answer and response forms. 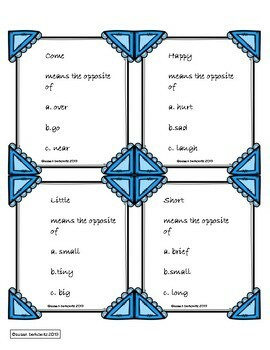 • There are 28 synonym cards and 28 antonym cards, for 56 text-based cards in all. These cards are multiple choice. 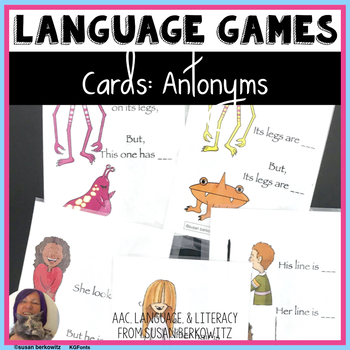 • There are now also an additional 28 cards each for synonyms and antonyms that contain pictures with a cloze procedure - students fill in the blank. That's 56 MORE cards!